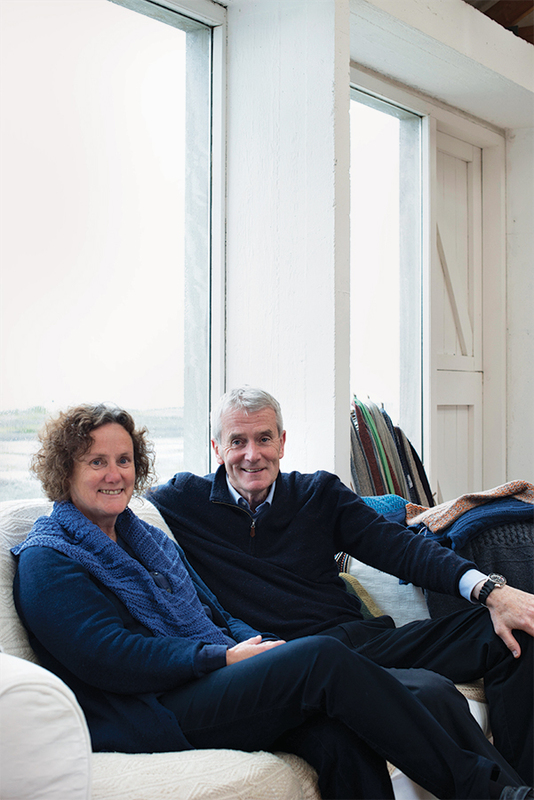 Tarlach and Aine de Blacam at their Inis Meain Knitting Company. 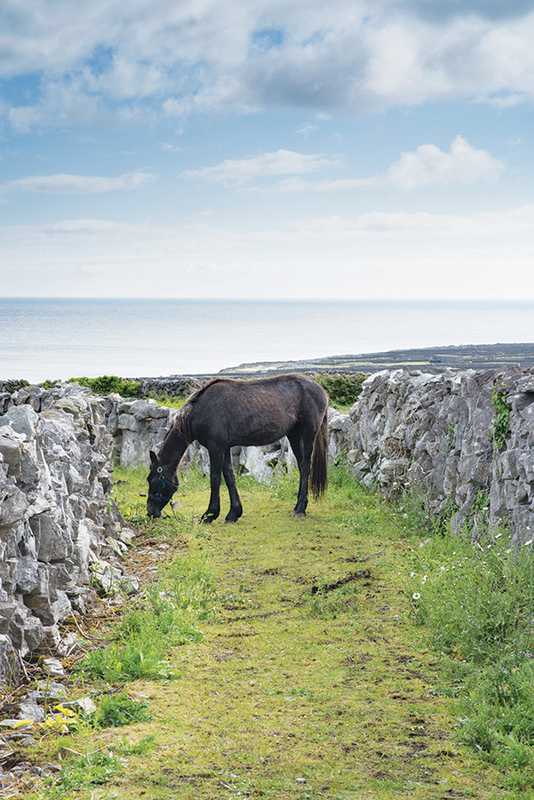 Stone walls crisscross the fields of Inishmaan. A guest room at Inis Meain Restaurant & Suites. On the rocky, windswept shores of Inisheer, looking back across Galway Bay to the Irish mainland. 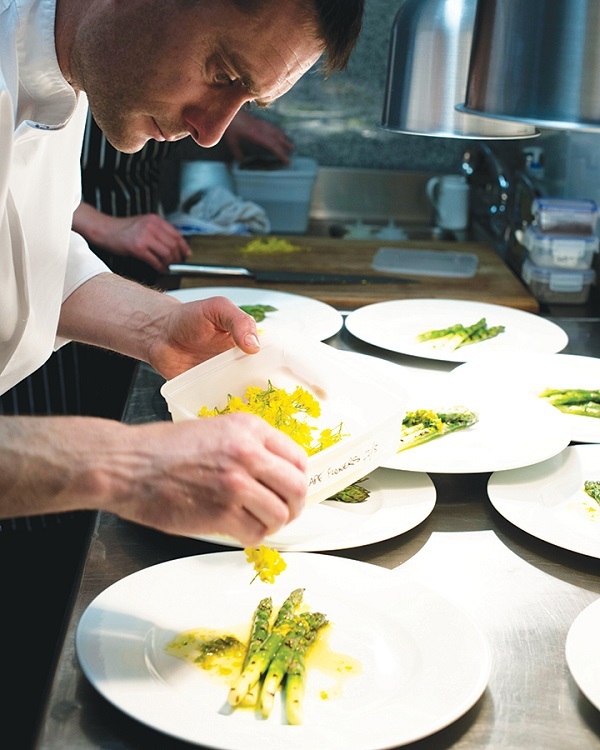 Ruairi de Blacam working his magic with local ingredients in the kitchen of his Inis Meain Restaurant. Mairead Sharry's Teas shop on Inisheer. Steeped in tradition, the islands’ Arcadian communities keep crafts like knitting and weaving alive, and Irish remains widely spoken. A chara, meaning “dear friend,” is a popular greeting. But lately, Aran heritage has been re-energized by a new generation of artisans and entrepreneurs, which I discover as I hop by ferry boat to visit the trio in turn. From Ros a’ Mhíl on the mainland, it’s a 45-minute journey across Galway Bay to Inishmaan, my first stop. 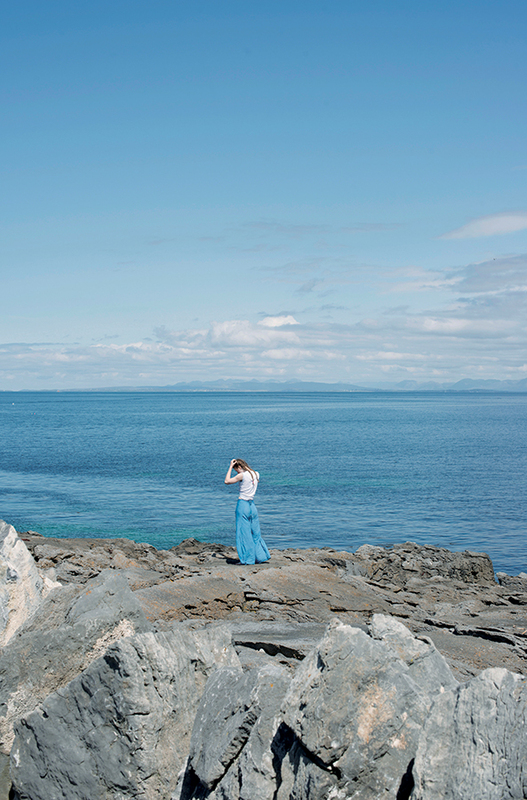 With less than 200 residents, the island—called Inis Meáin in Irish—is both achingly romantic and utterly remote, yet not without its comforts. Opened in 2007 by husband-and-wife team Ruairí and Marie-Thérèse de Blacam, Inis Meáin Restaurant and Suites is a low, limestone-clad building that blends in seamlessly with its surroundings. Its five suites, designed by Marie-Thérèse with “as many natural materials as possible,” are minimally elegant, with rough rendered walls, bespoke wooden furniture, and luxuriously woolen cushions and throws. Curling up with a book from the well-stocked shelves would be easy, but fishing rods, bicycles, and packed lunches are available for guests who want to explore the outdoors. 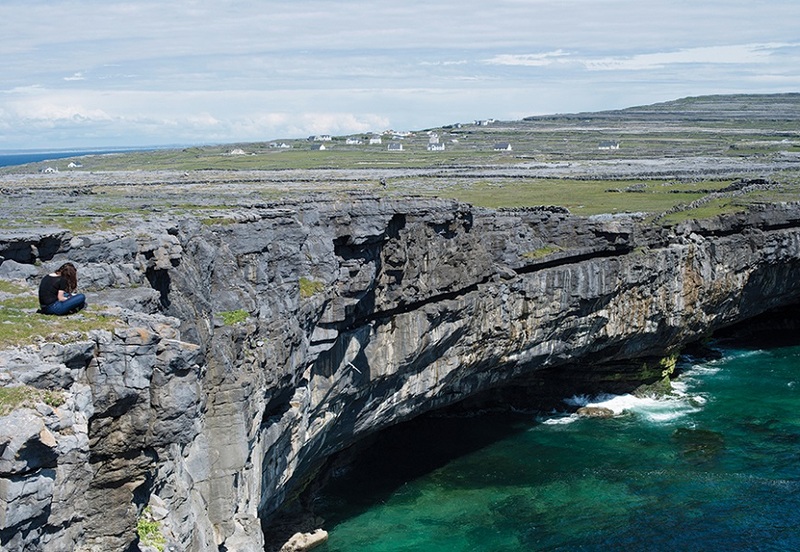 I cycle down narrow lanes called boreens between fields bound by low stone walls—according to my guidebook, there are more than 1,600 kilometers of these windbreaks crisscrossing the Aran Islands—and ramble along cliff tops where wild flowers entangle the fissured rock. 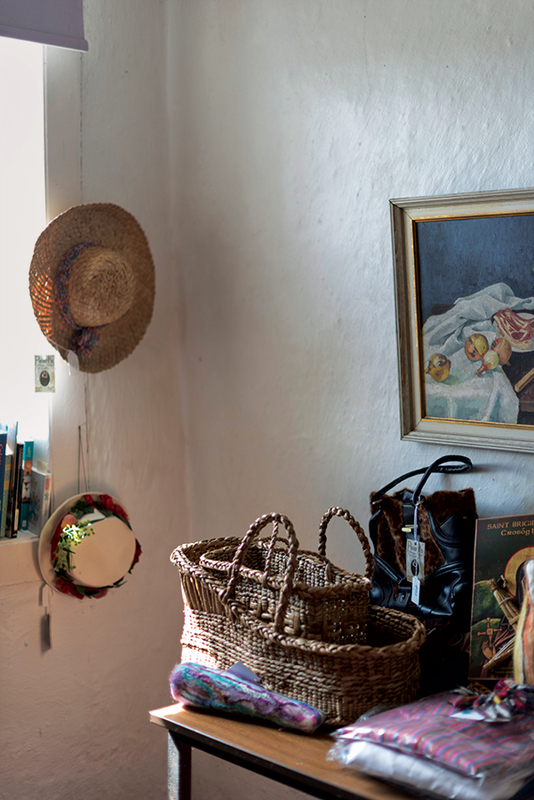 In the village, which comprises a pub, church, post office, a couple of B&Bs, and a 300-year-old thatched cottage (now a museum) once frequented by the playwright John Millington Synge, the air smells of freshly baked biscuits. At the Inis Meáin Knitting Company, I meet Ruairí’s parents, Tarlach and Áine de Blacam. Since opening the factory in 1976, the couple has been designing and manufacturing modish knitwear rooted in ancient Celtic patterns and inspired by the natural textures and hues of their island home; today, they export most of their products to exclusive stores overseas, including Barneys New York. “Guys in America are loving these shawls,” says Tarlach, picking up a mustard-colored alpaca scarf and draping it dramatically around his neck. Fortunately for me, they also sell samples of their gorgeous sweaters and scarves in an adjoining shop, whose walls are hung with old black-and-white photographs of Inishmaan farmers and fisherfolk. Come evening, I sit down to the set four-course dinner in Inis Meáin’s intimate 16-seat restaurant, where an elemental dining concept spotlights the pure flavors of local ingredients. Lobster tail is served with unctuous tarragon mayonnaise and peppery rocket flowers, and for dessert, a custardy prune tart offers a sweet counterpoint to the nutty bitterness of cream made with oats. The next day I take a ferry east to Inisheer (a.k.a. Inis Oírr), where I’m greeted by a sun-dappled shoreline stacked with lobster pots and curragh fishing boats. This may be the smallest of the three Arans, but my arrival coincides with Drop Everything, a biennial cultural festival that attracts a creative crowd from across Ireland, Europe, and the United States. Curated by Galway-born Mary Nally, the event fills three days with parties, music, workshops, and programs covering art, fashion, and science. The local handball court has been commandeered to showcase a mesmerizing audio-visual installation by New York–based artist Sougwen Chung, while Dutch silk screener Lukas Julias Keijser has festooned the island with bedsheets printed with the titles of classic pop songs. 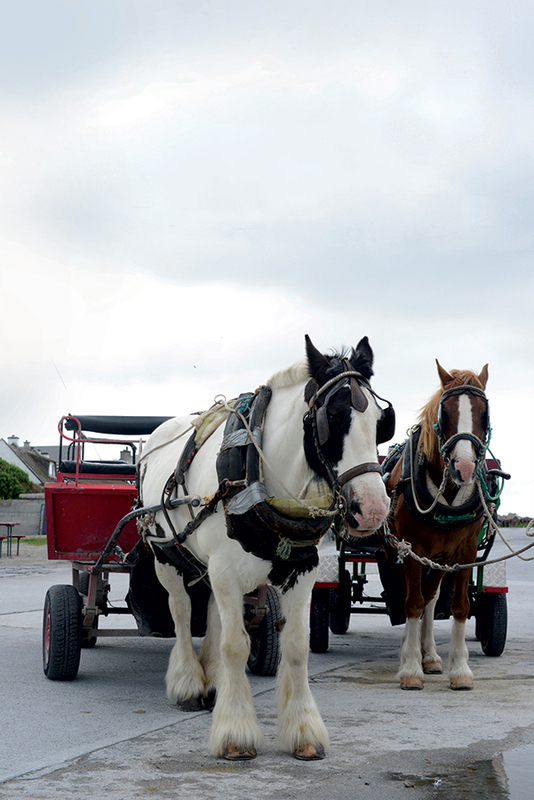 Encompassing less than six square kilometers, Inisheer is easily explored by foot. While wandering, I stumble upon the rusted wreck of a cargo ship washed ashore in 1960, as well as the Church of St. Caomhán, a forlorn ruin that’s sunken beneath the ground. But there are livelier attractions as well. 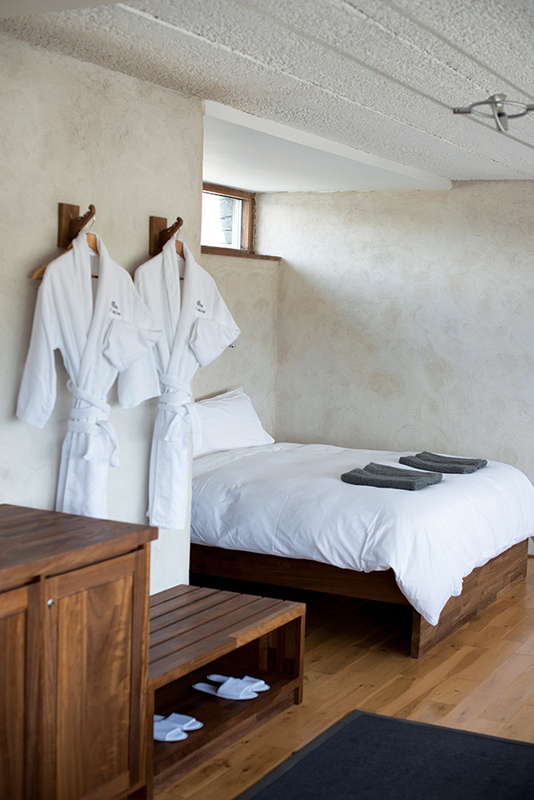 Aran Seaweed Baths and Spa harnesses the health benefits of local seaweed in treatments whose potent smells are enough to prove the plant’s alchemy. At the South Aran House cooking school, Maria and Enda Conneely teach everything from gluten-free recipes to foraging. Áras Éanna, the islands’ only arts center, is housed in a renovated weaving factory; when not taken over by Drop Everything events, the hilltop venue hosts a steady stream of Irish artists and performers. And in the main village, a cottage crafts shop called Teas sells a cornucopia of vintage and handmade wares. Its owner, Mairéad Sharry, is a smiley, crinkle-faced character with short claret-colored hair who also leads workshops on knitting, weaving, felting, and making pampooties, the islands’ traditional rawhide slipper.